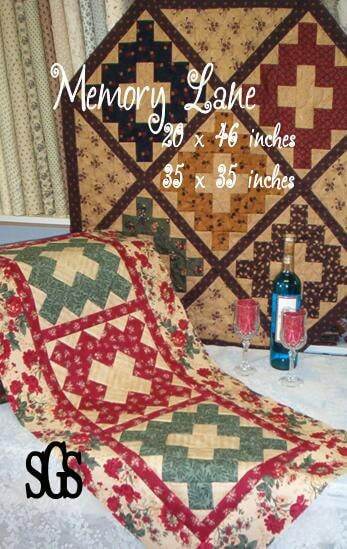 Memory Lane is 20 x 46 inches (table runner) and 35 x 35 inches (octogonal topper). It has clear directions printed in black and white along with a color front printed on cardstock paper. Pattern is held together with a metal brad paper fastener instead of a plastic bag. Pattern includes two options with yardage and instructions for both sizes. A perfect addition to a autumn table top display, buffet table christmas vignette. Fantastic pattern, can't wait to get started! Thanks!